We are quickly winding down this year and also quickly winding down the countdown of the top UC ballers of the decade. With the Bearcats kicking off Big East action Wednesday against UConn, look for a preview Wednesday. There will be a write up probably Thursday morning or Wednesday night. It depends because I may attend this game. There will be a Sugar Bowl preview going up Friday, and there is a 80% chance of a live blog Friday night. That does not say much about my New Years Day plans, but it works out for you, the reader. In case you have missed any of the countdown so far, here is a run down. 12-10, 9-7, 6-4. 3. Jason Maxiell. The man known as Mad Max comes in third on the list. I remember at Midnight Madness his freshman year, Jason Maxiell dominated the slam dunk contest and won the fans over that night. 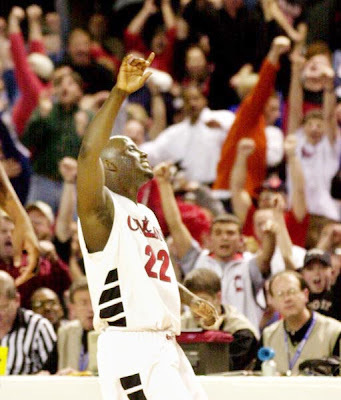 As the 6 man on the 01-02 Bearcats, Maxiell made an impact. He averaged 8 points and 6.8 rebounds and along with Donald Little and Jamaal Davis, they were a formidable front line. 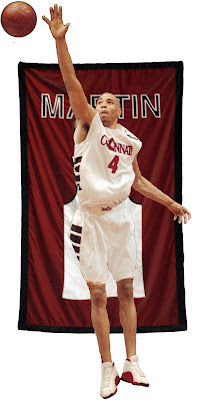 Maxiell entered the starting line up the next season and was a fixture the rest of his UC career. Max averaged 12, 7 and 1.9 blocks his UC career, capped off by a senior year in which he put up 15, 7.7 and 2.7 blocks a game. Maxiell was known for his shot blocking skill, and for his monsterous dunks. Jason seemed to want to break the rim with every jam. Max was the leader of the last UC team to make the NCAA tournament. He is also the leader of the last Bearcat team to win in the NCAA tournament. Who can forget him making his first 2 3s of his career against Iowa? I can. In another NCAA 05 story, Jason Maxiell had 50-14-6 to lead the video Cats past UConn in the Final Four. It's nice to see Jason doing well in the NBA as well. Also, check out that picture. 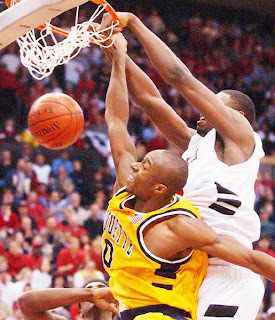 Maxiell slamming it down on some random Marquette player has to make you smile. 2. Steve Logan. Steve Logan may have a case for being the top Bearcat of the decade. But, part of the thing that hurts Steve is the fact that he disappeared off the face of the earth after the 02 season. And the other part is that number 1 is one of the best Bearcats of all time. That takes nothing away from 22. Steve Logan was one of my favorites from about the minute he stepped on campus. Logan showed flashes of his talent his freshman and sophomore years, while taking mostly a back seat. But, his last 2 seasons in Cincinnati, Logan showed he was a superstar averaging 17.6 and 22 points a game. He was mostly a scorer his junior year, and in his senior year, he evolved his all around game while playing point guard. Logan averaged 5.3 assists and 3 rebounds a game. There were quite a few memorable performances from Logan in his All-American season. He had 15 points and 16 assists against Coppin State. He had 1 game in single digits. If you take out the 2 Charlotte games, he had no fewer than 14 points in a game. Steve started the season with 31 against Oklahoma State, showing he could carry the load. In the Steve Logan pantheon game, he scored a career high 41 points while Southern Miss only had 37. He outscored a team! That UC team overachieved all season going 31-4 and earning a 1 seed in the NCAA tournament. They would lose a classic against UCLA in the second round. I was at nearly every home game this season, and this is one UC season, and player, I'll always remember. 1. Jihad Muhammad. Jihad Muhammad was the greatest Bearcat of the decade. Oh wait, no he wasn't. If you would like to get started today please just go to http://collegesportsfeed.com, create an account by logging in and start posting today! If you have any questions please let me know. I look forward to working with you and seeing the exciting content that you can produce. With the new rule that states a player has to be 19 years old and at least one year out of high school to enter the NBA draft- most basketball players are going to college for just one year, and then leaving right after.